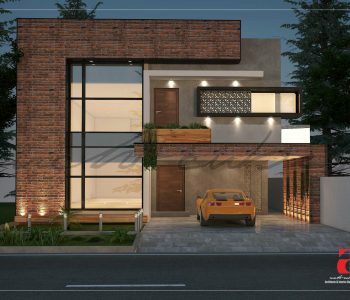 This design facade for a Home Residence by architects in dha lahore is stunning, displaying a cuboid, compact form. it’s created seem each minimalist we tend as fashionable at a similar time as we believe the facade of the home is what defines it even before you get to expertise the inside, all thanks to the simplest business leading architects square measure operating with their full strength to produce the simplest fine arts services. the employment of minimum variations in material and volumes build the general elevation look clean whereas the easy type with additional fin feature offers it a recent and fashionable look. The sleek elevation superbly combines the wood panel with the compelling reminder gray. A house should be a reflection of the ones inhabiting it. Keeping in view this idea the house was conceptualized by the designers at archicubes with a lot of thought. The earthly tints used on the façade were inspired by the colors of soil which are a symbol of humbleness and humility. The exposed brick was used a veneer to highlight certain elements. And the elegant architecture is maintained not only in exterior but in the interior too, with the perfect use of theme and philosophy. 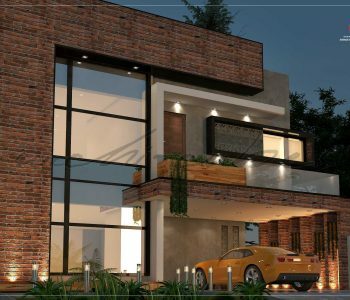 The richness of using both modern and traditional look in the façade by using glass, wood and brick, in such a way that they complement each other. The proportions were also kept in mind to balance the visual weight of the elements. Moreover, the planter was also strategically placed on the terrace from which the vines hang to give a sense of privacy to the main entrance door. The lighting also played a significant role in accentuating certain surfaces giving a feeling of warmth and joy.